The Panasonic LUMIX DMC-LX100 is aimed at enthusiasts who desire more creative control, great low light performance, and the best image quality possible in a sophisticated, take-anywhere compact. The LX100 packs a 12.8 megapixel CMOS sensor, bright 24-75mm f1.7-2.8 Leica lens, ergonomic dials, support for 4K and Full HD video recording, 11fps continuous shooting, Manual Focus Peaking, RAW shooting and Wi-Fi/NFC connectivity. 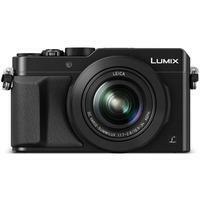 Panasonic LUMIX DMC-LX100 12.8MP Digital Camera - Black. Mint condition. Panasonic LUMIX DMC-LX100 12.8MP Digital Camera - Black Including leather case.